Here is my Sis Lynn experience that I am certain all of you are awaiting with eager anticipation. It was the evening of October 12th, 1984. Working that evening in the Science Hall. I set up a lab practical for Vertebrate zoology students, finished that task around 10:15 P.M., and went directly to Clark Hall. During this period I served also as the Board of Regents Director and my office was used to administer all the activities of the students enrolled in the Board of Regents Program. I needed to update data for a few students. As I entered, the buildingwas dark and quiet. I turned on the hall lights and headed for my office located on the first floor. I heard a crash coming from my office area. Upon entering the office, I saw three boxes of computer disks that I had placed on the top of the desk now lying on the floor. I returned them to the top of the desk and turned on my Apple 2e. I started entering the data when I heard a noise in the hall which sounded as if someone was rolling a bowling ball down the hall. I immediately checked out the source of the sound. I explored the hall, bathrooms, and classroom on the first floor but found nothing. All was quiet. I went back to my office and found that my computer was off. No power. I checked the plug and found that it was unplugged from the wall. I thought that I may have pulled the plug when I got up to check on the mysterious noise. I crawled under the desk and plugged in the computer. As I sat in the chair, something poked my posterior. It was a small ceramic mouse that was given to me by Deb Simon as a souvenir from her trip overseas. This was strange. I replaced it upon the computer monitor and decided that I had enough of weird happenings that night. I came home around midnight and dragged my ole body into bed. Now for the dream (If it was actually a dream – I am not certain). After quickly going to sleep, I saw coming from the left hand corner of the bedroom wall. It was a luminous vapor that I can only describe as the color of gaseous bromine. Bromine is a halogen element, and is a red volatile liquid at standard room temperature. (This element is corrosive to human tissue in a liquid state and its vapors irritate the eyes and throat and are very toxic upon inhalation.). I watched as the mist poured from the ceiling and onto the floor. Out from the red mist, a female outline was forming. She became clearer and I saw that she had her hair in a bun and was wearing a long dress. She tried to communicate with me, but her mouth was not moving. The message was something about secrets held too long. Just as quickly as she appeared the reddish vapor was gone. I awoke in the morning confused. I returned the next morning to work in Clark Hall and told no one of this experience - not even my best friend Bea Brown. As I turned on the computer monitor, I noticed that the ceramic mouse was missing, and I did not find it until 2005, 3 years after retirement. I posted a blog on December 17th , 2005, with photos from the Old Glenville Cemetery. Use the search function on our blog and type in Old Glenville Cemetery and you will see the photos from that day of picture taking. As I took a photo of the grave of Sis Lynn that afternoon, I noticed a small lump under the honeysuckle vines to the left of the headstone. I bent over to pick up the object and the recollections of that October night in 1984 came vividly racing through my mind. Here in my hands was the ceramic mouse that disappeared many years ago! In an earlier blog I addressed the subject of the ghost of Sis Lynn and posted a photo of her grave site. 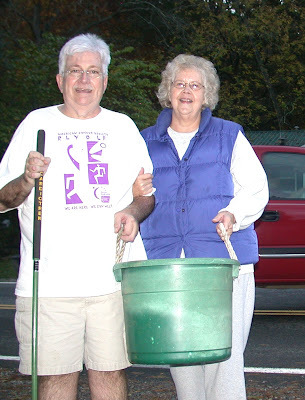 As you recall Sis Lynn is the resident spirit on the campus of Glenville State College. I am posting an article that was published this morning by Bob Weaver in the Hur Herald (www.hurherald.com). In my thirty years of teaching biology at Glenville State College I have come across Sis Lynn many times late at night. Tomorrow I will relate one story that happened around 10:30 P.M. in Clark Hall on October 12th, 1984. I have never related this story to a soul since it was not only baffling but involved actually communicating with Sis Lynn's spirit. Cold cases, unsolved murders, and restless spirits from the past…all of these things sound like they came straight out of a movie and not Glenville State College. There are countless eyewitness accounts from across the campus. The majority of these ‘experiences’ or ‘sightings’ happened in Clark Hall, Louis Bennett Hall, and the Administration Building. Many say the ghost in these buildings is ‘Sis Linn.’ There have been stories about her haunting the GSC campus since at least the 1970’s. 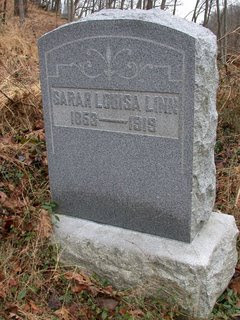 Sarah Louisa Linn was born in 1853. There is little known about her life. She was a graduate of Glenville Normal School in 1877, specializing in teacher education. She was the only person to graduate in 1877. She taught classes in Glenville and Fairmont. Sarah Linn married I. L. Chrisman in June of 1905 at her home where Clark Hall currently stands. After her short marriage ended, Sarah changed her name back to Linn and ran a boarding house out of her home for female students. In February of 1919, Sarah was found in her home murdered, bludgeoned to death…the assailant or assailants were never apprehended. Some say she was killed by vandals breaking in for her prized wine that she made herself. We may never know the answer; we may never know who the killer or killers were. Many say ‘Sis Linn’ roams the campus looking for her assailant or assailants. Five years after her murder, officials from the Glenville Normal School purchased her property, tore down the house, and built Verona Maple Hall, a modern women’s dormitory for the time. Many said the dormitory was also haunted. 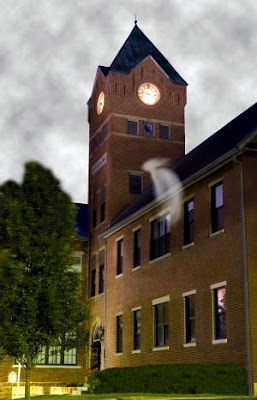 After Verona Maple Hall was demolished years later, the neighboring Clark Hall began to experience paranormal activity. Glenville State College Provost and Senior Vice President Dr. Kathy Butler is among those who experienced this activity. “My most memorable experience was in December of 1998,” she recalled. “The Saturday of the Christmas parade,” she said. She was alone working in her first floor office when all of a sudden, a loud noise surrounded her. “It was a horrific noise that sounded like every noise imaginable – banging, clanking, thumping, all together.” Dr. Butler thought there was something wrong with the heating system. She ran out of her office and up the stairs to see what was going on. When she ran up to the fourth step from mezzanine two, the door leading to the offices in mezzanine two latched. “The very moment the door latched, the noises stopped…dead silence. I froze,” Butler said. She backed slowly down the stairs and out the door leading to the parking lot. GSC English Department Chair Dr. Wayne De Rosset was driving down the hill and saw her white as a ghost with a look on her face that something was terribly wrong. They both went into Clark Hall to see what was going on, searched from the basement to the top mezzanine, and found that not one thing was out of place; everything was in order. GSC Teacher Education Instructor Connie Stout also had an experience in Clark Hall. “It was just before the first summer session started and I was in my office on the top mezzanine,” Stout said. She was grading papers when she heard a horrible noise. “It sounded like metal chairs being thrown around and as if people were moving metal desks,” Stout explained. She said that the noise lasted from ten to twelve minutes. “I thought it was Dr. Butler and the secretary moving things around downstairs,” Stout said. She stopped grading papers and thought for a moment. “It was weird though because the noise sounded like it was coming from downstairs, upstairs, and the space behind the offices.” So she decided to go downstairs to see what was going on. Just before she got to mezzanine 2 she thought to herself, “What if this is Sis Linn?” She said that at that very moment, the noises stopped…complete silence. She left the building and found Dr. Butler and the secretary. They had been out of the building for over an hour. Stout had been in the building alone. GSC Education Department Chair Dr. Kevin Cain was working late one evening alone in Clark Hall. He was in his office on the second floor when something peculiar happened. “I heard metal chains dragging on the floor and then a door closed; the door sounded like a prison door closing,” Cain said. He then took his work home with him and left the building for the evening. “After that, I started taking my work home all the time!” Cain exclaimed. GSC Dean of Student Affairs Jerry Burkhammer said that on Halloween night one year, he was standing outside of the former dorms at Louis Bennett Hall with a safety officer and saw a couple of students playing with a Ouija board. One of them started yelling. He asked what was going on, and they said they asked the board whom they were talking to. They said the board spelled out ‘Sis Linn,’ and she said that she was in Clark Hall at 12:00. “It was four minutes until midnight,” Burkhammer said. “We decided to walk up to Clark Hall to see if anything was happening. At the stroke of twelve, a light came on in Clark Hall on the second level. We saw a woman hanging by a noose in the window. The officer and I ran upstairs, and when we got to the door, the light went out. We opened the door and nothing was there…everything was in order,” Burkhammer said, “It is strange and unexplainable; the clock tower chimes thirteen times on Halloween night at midnight. It does this every year.” Burkhammer said that when LBH was the men’s dormitory, there were strange occurrences five years in a row. These occurrences happened in room 225 on the first night freshmen stayed in the dorms. GSC Head Track and Field Coach Cameron Perry said, “I was awaken during my first night in that room and saw a lady in white at the foot of his bed when she spoke to me.” Now that Louis Bennett Hall houses offices, faculty and staff still report unexplained noises and sightings. Connie Stout said that you often hear someone running back and forth on the fourth floor. Pickens Hall has its share of stories as well from others who wish to remain anonymous. They say in the Scott Wing, in any room, you can hear someone playing with marbles and marbles rolling across the ceiling. You can also hear people moving furniture on the floor above, even the top floor. Others say the Wagner Wing is home to the little girl with the doll. A former Wagner Wing Resident Assistant reports glancing in a window in the stairwell and seeing a little girl with a doll holding her hand. A Snapper of An Evening! Last evening Judy and I were eating supper when a neighbor called and said that there was a big turte on the road in front of the grade school. 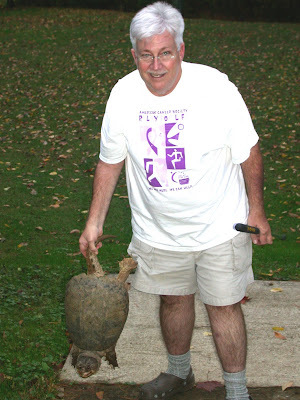 I knew it either had to be a common snapper or a softshell turtle. 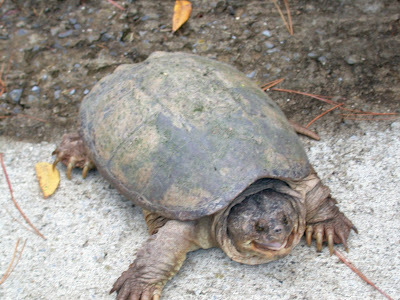 After describing each, we decided it was definitely the common snapper (Chelydra serpentina). We stopped our gourmet meal and we were off to the school with green bucket in hand. Notice the stupid smile on my face- I always smile like this when a reptile is in distress. There she was just crossing the road. We picked up the critter (by the tail!) and placed her in the back of the van. The relocation site was the backyard of Don and Marilyn Phillips across the street from our house. Stewart's Creek meanders along their property. Don came out to help. With snapper in bucket we rolled the critter down the bank into the stream. PROBLEM! The ole turtle landed on his back. Cold blooded reptiles tend to pass out briefly when on their back since the blood supply to the brain decreases. Don saved the day. 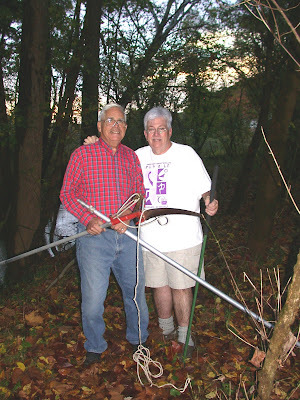 He supplied an extension pole to reach down from the slippery bank and we easily turned the beast upright. We returned to the house and warmed our supper in the microwave. It is always a good thing to be part of a reptile rescue team. Through our married life, reptiles are not the only critters that has been rescued. I married a good and caring lady! This weekend we had another great weekend with Dan and Pix in Pocahontas County. Judy and I were surprised that the trees were so glorious! Originally our idea was that this summer and fall have been so dry that we thought that the trees would turn brown and fall. We were wrong. Today we drove from Seebert to Glenville and we are posting the fall color especially for our west coast families. Judy is on the trail at Cranberry Mountain information Center. The view from Cranberry Mountain is fantastic. As we walked the trail, two species of trailing groundpine were poking out from the leaf litter. The Cranberry Mountain Information and Nature Center is always a favorite rest stop for the leaf peepers. As we left, a tour bus from Florida was pulling into the facility. I had to stop by Cranberry Glades Botanical Area to check out the fall foliage in this area. The Round Glade was starting to bloom with the cotton grass. What is more pleasing than a beaver pond in the fall? The last two photos were taken from Powell's Mountain on Rt. #19. We hope you enjoyed our view of fall foliage. It is always so great to be able to live in this area. Leaving Davis, we entered into Canaan Valley. We did stop at the lodge at Canaan Valley State Park. In the park the Tucker County Cross Country team was competing with a nearby school in Maryland. What a great area for a cross country event! The teams were heading down Blackwater River Trail. The temperature was in the 70's and the sunshine made the trees glow. Hope these kids realize how lucky they are to have such a glorious area in which to compete. Here are a few glimpses of the fall foliage. I took these photos in late evening so the colors are not as vivid as they were earlier in the day. We headed home around 4:30 P.M. and arrived back in Glenville around 8 P.M. What a blessing retirement has been! I always talk to my good friend Curt in Ripley and say "What are ya doing tomorrow? Oh I forgot - YOU HAVE TO GO TO WORK!" After a fine breakfast of waffles at the hotel, we walked to the depot and then to Judy's quilting temple. The official name of the temple is the Elkins Sewing Center - this shop is always on the agenda when we are traveling in Elkins. We were uncertain as to our plans for the day until we saw this "sign". There in the road was a fork! This was probably the first time I actually saw the "fork in the road." The fork had been smashed but the tines were pointing toward the North. Decision made- we will take the northern mountain route to Parsons, on to Davis, and return to Elkins through Canaan Valley. As we approached Thomas, the large wind powered generators came into view. It seems we always have to stop and take a closer look at these turbines. It was time for lunch when we ventured into Davis. This community in Tucker County was incorporated in 1889 and named for the family of Henry Gassaway Davis, a United States Senator from West Virginia, 1871-1883. Davis is the loftiest municipality in the state at an elevation of 3,099 feet above sea level. Davis is perhaps best known as a travel destination. Both Blackwater Falls State Park and Canaan Valley State Park are located nearby, as are Timberline and Canaan Valley ski resorts. The Canaan Valley National Wildlife Refuge is also located near Davis. The town is located in the northern Monongahela National Forest. Many shops, restaurants, and lodging facilities in David cater to visiting skiers and other tourists. Little did we know that a tragedy was unfolding this day at nearby Dolly Sods. A Morgantown family has a autistic son (Jacob Allen - age 18) who is lost in this area. Search crews have been frantically searching for the fellow since Sunday. As of this morning, the lad has not been found. Our prayers go out to him and his family. We should also give thanks to the hundreds of volunteers involved in the search process. Oh where shall we eat? This burrito establishment has a name that really calls to me. However, the good aroma coming from Sirianni's Cafe captured us! The folks at Sirianni's serve fresh pasta, salads, and entrees in an interesting atmosphere. The screen door at Sirianni's is most interesting. Judy is so content after a meal of gourmet pizza. Tomorrow you will see the fall colors that were on display in Canaan Valley. After four days, our lost 18 year old, Jacob Allen, has been found alive in the Dolly Sods area. HURRAY! What a blessing! 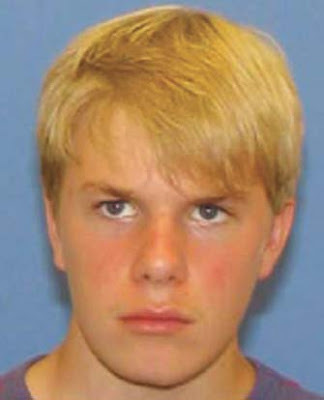 Jacob was found at 2:15 on Thursday afternoon. First news indicates that he was in good shape. After church on Sunday, Judy and I went to Buckhannon to dine at our favorite Mexican Restaurant - Carmonas. After a yummy meal of shrimp in chipotle sauce (SPICY! ), I stopped on the way out of town to take a few shots of the Upshur county courthouse and the new mural on Main Street. The Upshur County Courthouse was designed by architect Harrison Albright and is one of our favorites in the state. We then drove on to beautiful downtown Elkins and checked into the Holiday Inn Express. This hotel is located in the old railroad yard which now is being developed into a great tourist area. It is here that the newly renovated Railroad Depot and Information Center is located. The depot serves also as a boarding area for the scenic Tygart Flyer train excursions that travel from Elkins to the High Falls of the Cheat This area will also be the site of a new Railroad Museum. We were in Elkins to see the evening performance at the new American Mountain Theater. http://www.americanmountaintheater.com/ The new theater has been open only two months so that is the reason their website needs updated with the new cast and location. Judy and I enjoyed the show. It is a live variety show with some really talented performers. The majority of the performers are from two families. We would urge you to take an evening and enjoy the show. Next month the folks will be gearing up for their Christmas show. In the theater lobby is a neat artifact from the past. I am certain that this is on loan and will be included in the collection when the Railroad Museum is completed. Let's see. What sights were we to behold on Monday? You will know since tomorrows blog will follow our mini-vacation into the mountains.